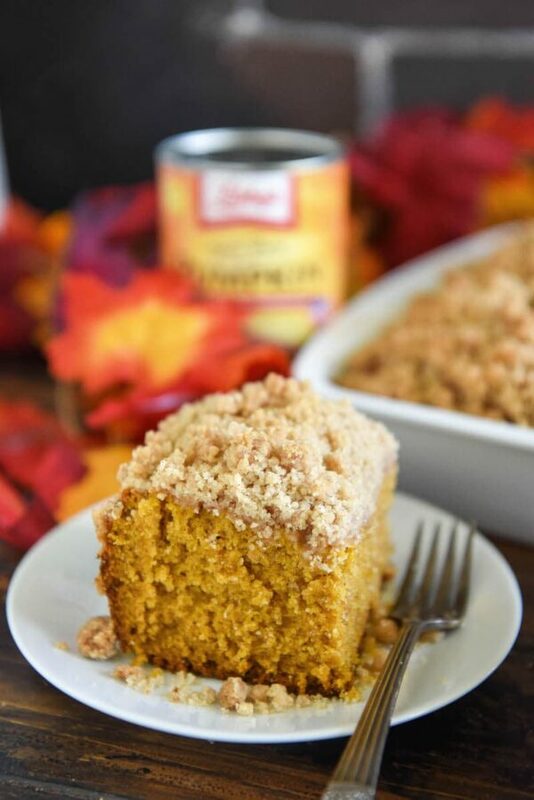 Pumpkin Sour Cream Coffee Cake: an extra moist pumpkin spice cake, topped with a cinnamon crumb topping, makes a perfect Fall breakfast coffee cake or dessert! Coffee Cakes (also sometimes called Crumb Cakes) might be one of my favorite things in the world because you get to eat cake for breakfast. Seriously, what is better than cake served in the morning with coffee? I’ll tell you what, nothing. Well, except when you make that cake pumpkin flavored, because then that is just a tiny bit better. 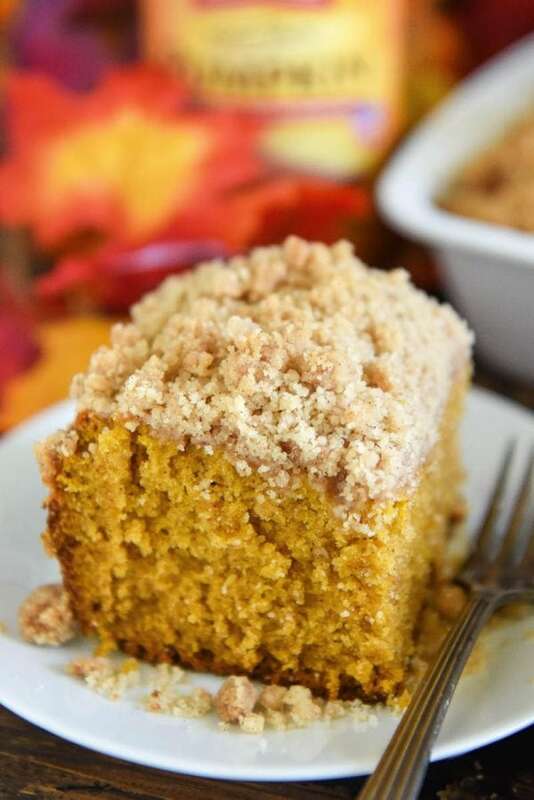 However, to be fair, this Pumpkin Sour Cream Coffee Cake is also amazing for dessert. Or snack. Or lunch. Or 1 am. It’s literally delicious anytime you want to eat it. It just sits on the counter calling your name when you walk by. I mean, just look at that thick layer of homemade pumpkin spice cake. Take it all in. I’ll let you in on a secret, it even smells and tastes way better than it looks. Plus, like my all time favorite Pumpkin Dream Cake, the cake itself is extra moist as well! And the cinnamon streusel topping really sets it over the top in the best way possible. If you are feeling extra crazy, instead of just cinnamon you could use pumpkin pie spice in the crumb topping. However, in my humble opinion, the pumpkin cake already has a whole tablespoon of pumpkin spice in it, so I think the cinnamon on top is perfect as is. I know some of you will ask, so I want to go ahead and address the question. YES, the cinnamon streusel topping is necessary. Ok, not 100% necessary, but it is 100% recommended. Without it, it just doesn’t have that same amazing coffee cake pizzazz we all love. It’s definitely worth the few extra minutes. If you are not a pumpkin fan, this cake would also be amazing made with butternut squash puree or sweet potato puree. As long as they have the same texture as canned 100% pumpkin puree (not pumpkin pie filling!) it will work just fine. 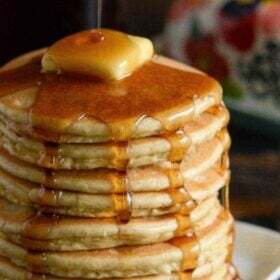 I found the recipe shared on Facebook and want to make it, but having read through it several times it is clear that you have to divide the flour and sugar for use in different parts of the recipe but you never say how much to use in each part. Can you clarify that? 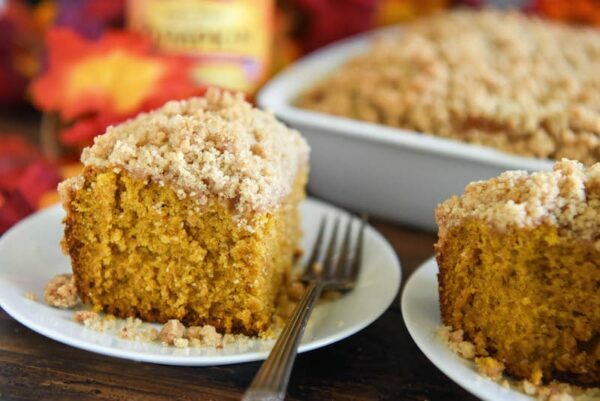 I need the recipe for your Cinnamon Crumb Topping to make the Pumpkin Sour Cream Coffee Cake. They were having website issues, but all should be resolved now and you should see the two sets of ingredients. But just in case you don’t, here are the streusel ingredients! 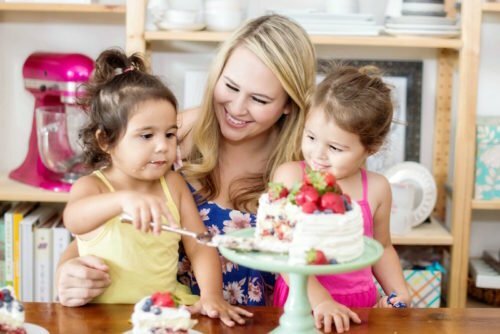 How much flour for the cake part? I’m assuming the three cups is both cake AND topping. Thanks. Why did you leave out all the cups and tsp/tbsp’s of everything in this recipe??? need the flour and sugar amounts for the crumb topping and is it included int the cake part?? thanks, looking forward to making this fall dessert. 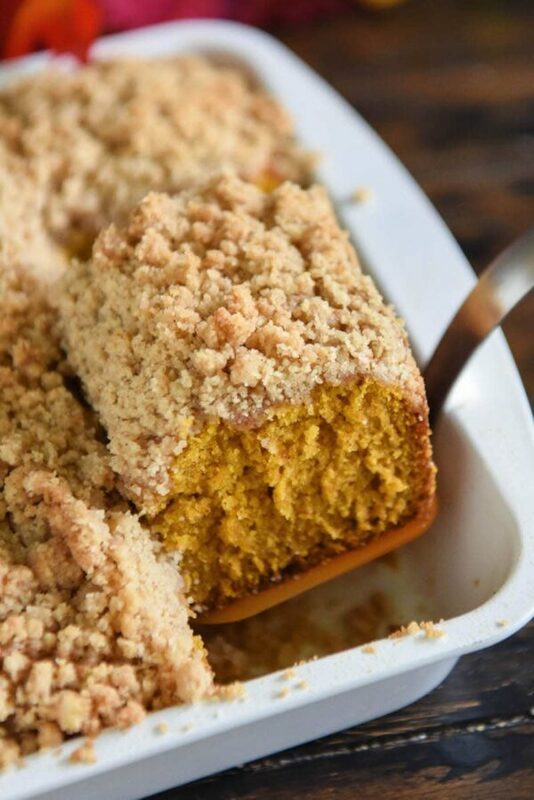 Hi…Jessica….marvellous recipe and this is perfect for dessert & snacks, it’s look soooo yummy and delicious, but i do’t like pumpkin, so i will make definitely with butternut squash puree…! Thanks for sharing…..! 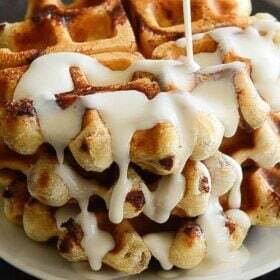 I would love a piece of this with my morning coffee!! It sounds fantastic!! Adding this to my fall baking list! Looks so good! Hi Jessica! I am also waiting for the correct amount of ingredients for the topping. I make sour cream coffee cake several times a year and can’t wait to try this one. I got all the ingredients out yesterday afternoon and started to measure everything out when I noticed there was no separate list for the topping. I’m sure it will be delicious! PUMPKIN EVERYTHING! I’m soooo onboard with making a batch of this coffee cake! 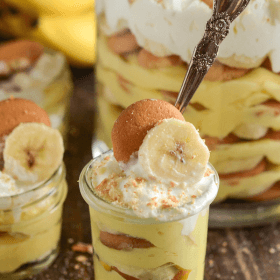 I found your recipe on Pinterest, I also watched the video of the cake witch by the way was really desirable as a recipe but I couldn’t find the recipe itself ? So I’m guessing that I’m supposed to subscribe myself in order to get access to the recipe, am I right ? Thank you very much for your help, it’s really appreciated ! It looks and sounds so good! Can’t wait to give this a try! There is no recipe on the website……. 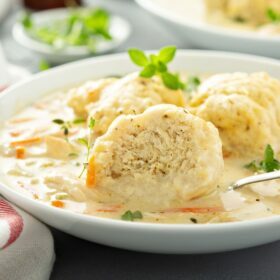 I just saw the video of this recipe and I want to try it. 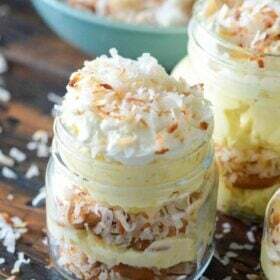 Me I have the full recipe? With all ingredients and procedure. 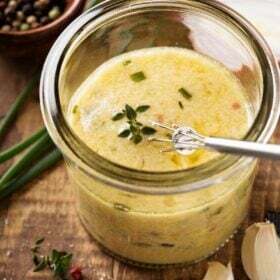 Hi I would like the full recipe measurement but I dont see it anywhere on this page. I can’t find the recipe for your Pumpkin Sour Cream Coffee Cake. Please provide. Thanks do much! This sounds absolutely delicious! I’m about to start making it, however I’d love to print it. I don’t see “print”. I hit the print button feature on my phone, and the text isn’t readable it’s so small. Any help is appreciated! Btw, I went to fb to like you, and there’s nothing there, just a blank page. Me? I followed this recipe to a T, but it took much longer the. bake, and the streusel topping melted into the cake. Also, it was not done in places, but that could be a problem with my oven, not the recipe. I’ll give it another try, because despite its flaws, it is quite good. I “think” mine cooked for at least 25 extra minutes, and it still wasn’t done! I say think, because I have a new oven, I put this in, set the timer and took a shower. I never heard the timer go off. By my calculations, I was at least 20 minutes late for the timer going off. Checking it, I couldn’t tell if that was goo from the cake, or from the streusel, so I gave it 5 more minutes, worried that I really overcooked it. The streusel was so thick, cake gooey in the center. The streusel also doesn’t appear to be so thick in the photo, as it is in the recipe. I’m making it again tomorrow, however I’m cutting the streusel in half. This was delicious and perfect for fall and Halloween! Thank you for the recipe which will for sure be a new addition to my family’s breakfasts in the fall from now on. So there is only 1cup flour in cake part?? Is it updated now?? Or is it still 3c flour for cake and 2c flour for topping? Thanks! Yes, there is 2 cups of flour in the streusel topping and 3 cups of flour in the cake. Hope this helps!